On January 28, 1948 a plane chartered by U.S. Immigration Services crashed in Los Gatos Canyon, California. The plane was carrying 4 American crew members and 28 migrant workers deported from California back to Mexico. Many were part of the “bracero program” and had finished their government-sponsored work contracts. A ride home was part of the deal. Others had entered the country illegally. There were no survivors from the crash. It was one of the worst aviation disasters of the era and was widely reported. 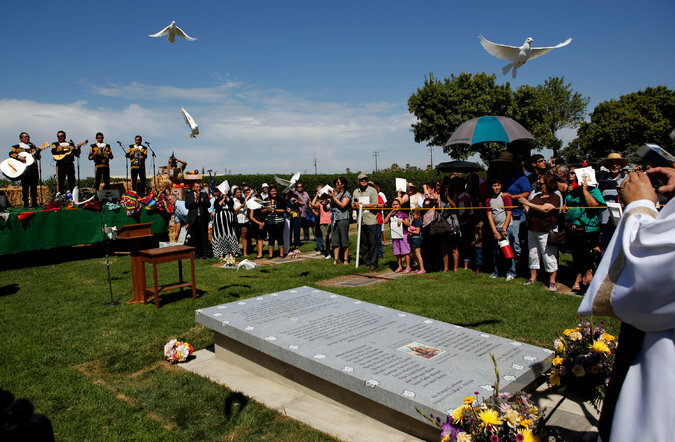 The 28 migrant workers went mostly unidentified and were all buried in a cemetery in Fresno, California, in one mass grave. Woody Guthrie was living in New York City at the time. The day after the crash the New York Times reported on the tragedy, providing the names of the 4 dead Americans while noting that the 28 other passengers were simply “deportees”. Woody was disgusted by the news coverage in general, which he felt consistently memorialized the 4 dead Americans while marginalizing the deaths of the 28 migrant workers. Woody wrote a poem about the plane crash. According to Woody’s biographer, Joe Klein, “It was the last great song he would write, a memorial to the nameless migrants ‘all scattered like dry leaves’ in Los Gatos Canyon, where the plane crashed… The song, as he wrote it, was virtually without music – Woody chanted the words – and wasn’t performed publicly until a decade later when a schoolteacher named Martin Hoffman added a beautiful melody and Pete Seeger began singing it in concerts.” The song’s title varies from “Deportee (Plane Wreck At Los Gatos)” to “Plane Wreck At Los Gatos (Deportees)” to simply “Deportee”. On September 2, 2013 a memorial service was held at the mass grave for the 28 migrant workers. A monument was unveiled to serve as the grave’s permanent headstone. The $14,000 for the monument and ceremony was raised largely by donations of less than $20 from individuals, including Woody Guthrie devotees and families of farmworkers. The monument is etched with 32 falling leaves, four of them bearing the initials of the Americans who died on the flight. In the center are the full names of the 28 migrant workers. Geez, I grew up listening to this 2-album set practically on a nightly basis. And it still sounds great today. Two good versions, and this in addition to Billy Bragg’s excellent version from 1986 as well. I’m going with Joe Ely’s version because I think his Spanish lyrics are sung with a better accent. A lot of people have covered this song and it’s virtually always played at a slow pace, usually with acoustic instrumentation.. I like the way The Black River Republic took it on with a fast, somewhat frenetic pace. Despite going against stylistic convention BRR still presents a reverent, somber picture. Joe Ely & Los Super Seven’s version is what I’d call the conventional approach to covering this song, which does not necessarily mean it is a poor approach or cover. On another day I might feel a different way but this morning I’m enjoying the energetic take of BBR more. And although E&LSS’ version is quite beautiful, I don’t thing the tone is right; it is too perky, almost whimsical, for the subject matter. I liked them both, but gave it to Black River Republic. They sounded more outraged about the whole travesty, and it just sounded more heartfelt. I guess when push comes to shove, I go with the punkier version, cuz I’m a goddamn punk, man. You are a punk, Plotnick. It’s probably why so many people refer to you as Punk Plotnick (and ironically you seem to hear Dr. Plotnick instead!). I picked BRR. Joe Ely’s version is very sincere, his band has the word Los and their use of instrumentation lends authenticity, but damn it! You lose two points for accordion in all but a few settings and it pisses me off that he sings “Jesus y Marie” instead of Maria! Come on Joe! Arlo’s version is as good as any. I also like The Byrds and Sammy Walker versions. Sammy Walker did an album of Woody Guthrie songs in 1979 that Kerry has which is wonderful and almost impossible to find a copy of.